Download a sneak peek of Will Wright's much-anticipated evolution simulator. 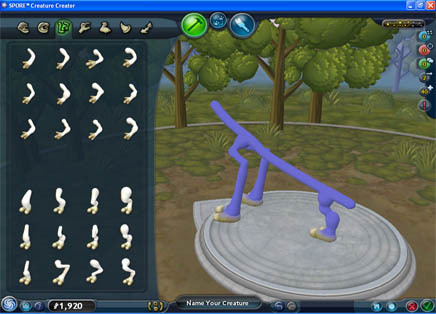 Here's the happier thing: The Spore Creator, the first bit of public code from the much-anticipated video game Spore, is now available for download. 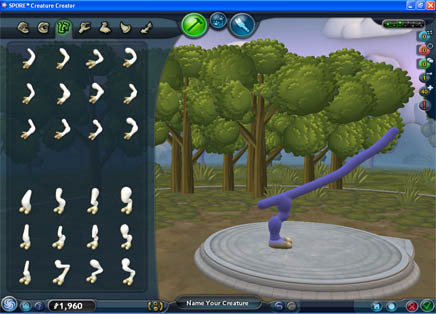 Spore, of course, is Will Wright's next video game. You may remember Will Wright from his previous hits -- SimCity and The Sims, say? Spore, which Wright's fans have been salivating over for years, has been called Sim Everything, or Sim Evolution: It lets you watch and guide the development of a species from the lowest scale -- the cellular level -- all the way to the largest, when your species acquires advanced intelligence and can hop through outer space (in other words, it becomes Snoop Dogg). Spore will go on sale in September. 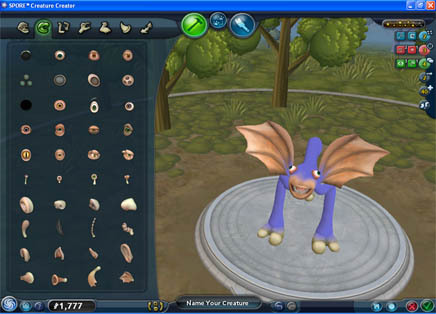 But today Maxis, Wright's game company, is releasing one portion of the game, the Creature Creator, for everyone for free. Think of this as a pre-release demo, but with a twist. 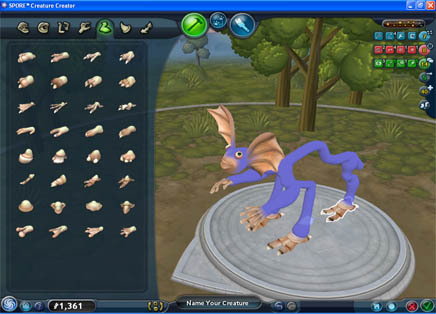 Will Wright calls Spore a "massively single-player" game, a clever way of saying that you'll play the game by yourself, but it'll be thoroughly social, populated by stuff that other people have created in their single-player games. 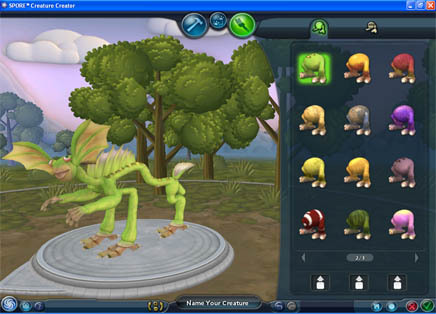 Maxis hopes that during the next few months, people all over the world will download the Creature Creator and build enough interesting Spore animals to fill the full game when it's released. 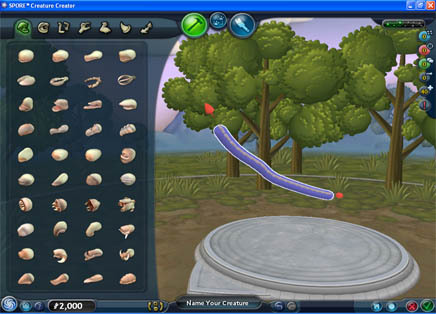 Last week, Maxis invited the tech press over to its office to test out the Creature Creator. I've been playing it often since then: The Creature Creator is delicious, addictive fun. You'll grasp Spore's intuitive interface in seconds, and after that your imagination takes reign. 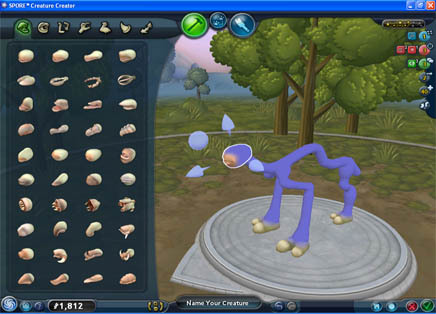 Pull legs, arms, feet, mouths, and various other animal parts onto your creature, resize and rotate and stretch and bend every bit of it, and then paint the whole thing to your delight. Even though you can't yet do anything with the creatures you create -- there's only a Test Drive mode, which lets your character walk, jump, and perform a few antics within a small circle of Spore space -- just building them is enough to keep you occupied for weeks. And then there's the social part: You can share each of your creatures in the Sporepedia, an online, public repository of Sporey things. There, people can rate and comment on your animals, and folks can also select them to populate their Spore games. The game's also got built-in YouTube sharing -- down below, I've posted a clip of Strange Fish, the Spore creature I made last night. Here are screenshots of the creation process. 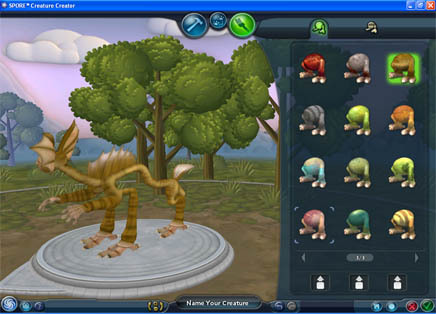 Or try your own: Download The Spore Creature Creator, available for Mac or PC, here. And how about two in the front? I raved about Spore in my video for Current TV this week.